A new study of Australian online shopping habits has revealed that 44.2 per cent of us buy regularly and, as the study, suggests makes conditions ripe for Amazon’s pending arrival in Australia. 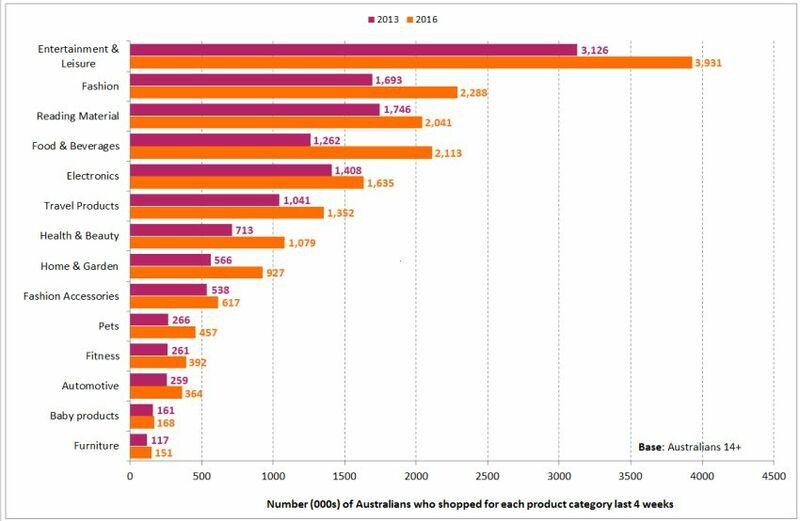 The research by Roy Morgan found that in any given four-week period last year, just over 8.7 million Australians aged 14-plus bought one or more products via the internet. This equates to more than 1.7 million additional shoppers per four weeks since 2013, when nearly 7 million Aussies (36.4 per cent ) shopped online in an average four weeks. Entertainment and leisure items account for the greatest number of internet shoppers, with 3.9 million people buying something from this category in any given four weeks, followed by fashion (2.3 million), food and beverages (2.1 million) and books (2 million). But while online shopping is gaining ever-increasing momentum with Australian consumers from all walks of life, those most likely to make purchases this way still tend to be from the more technologically savvy end of the spectrum. According to Roy Morgan’s more than half of all online shoppers (51.9 per cent) fall under the umbrella of either technology early adopters or professional technology mainstream, the two most digitally inclined segments of the population. As their name suggests, technology early adopters are always the first to purchase and use new technologies, and tend to be well educated and high-earning. Whereas they comprise nearly 20 per cent of the overall Australian population, they account for a fraction over 30 per cent of all people who buy something online in an average four weeks. Similarly, the ambitious, early-adopting professional technology mainstream comprise just over 17 per cent of the population and almost 22 per cent of all online shoppers. Meanwhile, the less switched-on technology Traditionalists and technophobes are under-represented among Australia’s online shoppers.